Fulfilled by Retro Gear Shop, Ships express in the USA with USPS Priority Mail (estimated 2-3 business days) (ignore amazon delivery ship estimate) Find us on instagrm for coupon savings and new items. Item description: From the mind of Ryan Adams comes a new guitar utility with more tricks up its sleeve than a 1980s supervillain. 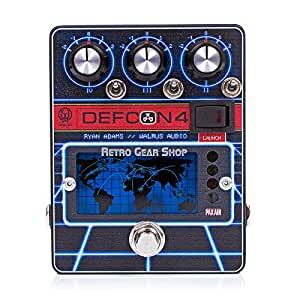 The DEFCON4 works as a preamp and EQ to meticulously craft your guitar’s sound. Bring peace time to your tone and avoid tedious amp tweaking during a set by using the DEFCON4 to easily switch from single coil to humbucking instruments with a quick twist of the rotary knobs. When the Launch switch is engaged, go into DEFCON 1 and activate a searing boost for your guitar. Use the Low (IV), Mid (III) and High Band (II) rotary knobs to cut and boost frequencies of your signal. The toggle switches will activate or bypass each frequency. When activated, the corresponding illuminated numbers will turn on. Flip the launch switch to go to âDEFCON 1â and activate a 10db MOSFET boost. From tone to knobs, Ryan worked very closely with us on exactly how he wanted it to look and sound. âI want this to look like someone from the 80s was pushing the technology they had available at the time.â -Ryan Adams The DEFCON4 comes in black texture enclosure with artwork inspired by the 1983 movie, “WarGames” and Ryanâs love for all things 80âs nostalgia. The die-cast enclosureâs exact size is 3.68â x 4.67â x 1.547â. Power requirements are 9VDC, center negative (100mA minimum). The use of an isolated power supply is recommended for powering all Walrus Audio Pedals. Daisy chain power supplies are not recommended. Power supply not included.